Bovec (pronounced [ˈbɔːʋəts] ( listen) or [ˈboːʋəts]; Italian: Plezzo, German: Flitsch, Friulian: Plèz) is a town in the Littoral region in northwestern Slovenia, close to the border with Italy. It is the central settlement of the Municipality of Bovec. Bovec was attested in written sources in 1070 as Plecium and Pletium (and as Vlicez in 1181–96, Plezio in 1257, and Pleç in 1377). During the 12th and 13th centuries, the name designated not only the settlement itself, but also the wider Upper Soča region, including the Trenta Valley. The Slovene name is derived from the Slavic form *Blьcь, but this itself is of pre-Slavic origin. The Friulian and German names indicate that the names may be derived from *Plitium or *Pletium, which could possibly be connected with the oronym Phligadia mentioned by the ancient Greek geographer Strabo or the place name Phlygades. Less likely possibilities include a connection to the ancient place names Ampletium and Planta. In the local dialect, the settlement is known as Bec. Archaeological finds in the upper Soča Valley indicate continuous settlement since the Hallstatt era. In ancient times, the area on the Roman road leading up to the Predil Pass was part of the northeastern Venetia et Histria region of the Italia province. It was incorporated into the Carolingian march of Friuli, after Charlemagne had conquered the Italian Kingdom of the Lombards in 774. With the medieval Kingdom of Italy, it came under the rule of King Otto I of Germany in 952 and was incorporated into the Imperial March of Verona. Bovec itself was first mentioned in 1192, when it belonged to the ecclesiastical Patria del Friuli, ruled by the Patriarchs of Aquileia. It was part of Tolmin (Tolmein) County, which was conquered by the Republic of Venice in 1420 and incorporated into the Domini di Terraferma. The lands on the upper Soča River were finally annexed to the Inner Austrian lands under Emperor Maximilian I during the War of the League of Cambrai in 1509 and added to the County of Gorizia (Görz) in the south, which Maximilian had inherited in 1500. 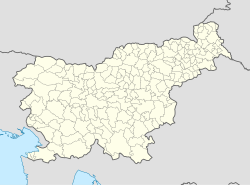 Elevated to the Princely County of Gorizia and Gradisca in 1754, the majority of the predominantly Slovene-speaking territories of the province—with the exception of a brief period between 1809 and 1813, when it was included under the Napoleonic Kingdom of Italy—remained under Austrian rule until 1918, from 1849 within the crown land of the Austrian Littoral (Küstenland). Slovene completely replaced German as the language of everyday communication in the 19th century. During the last Austro-Hungarian period, when the Littoral was part of Cisleithanian Austria, Flitsch was administrated within the Tolmein district (one of the 11 districts within Küstenland). 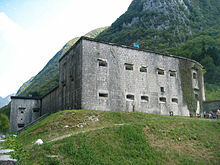 The Austro-Hungarian Army had two fortresses erected along the Predil Pass road, the well-preserved Bovške Kluže (Flitscher Klause) in 1881–82 and the ruined Fort Hermann. Bovec was heavily damaged by the 1976 Friuli earthquake. Another moderate quake with a magnitude of 5.6 on the Richter magnitude scale shook the town in April 1998, and a weaker one occurred in July 2004, with a 4.9 magnitude. Area destinations include Boka Falls, Mount Triglav (2864 m), the Soča River, Lake Krn, the Kanin (Sella Nevea) ski resort, the Vršič Pass (1611 m), and the mountain road to the Mangart Saddle. Activities around Bovec include kayaking, rafting, hiking (the Peace Trail from Bovec to Kluže Fortress, the Soča Trail, and the Alpe-Adria Trail), performances by Društvo 1313, cheese tasting on the Mangart Plain, the Kanin circular cableway, Prestreljenik Window (Slovene: Prestreljeniško okno) and other karst features, a zip line, and fishing. ^ "Bovec, Bovec". Place Names. Statistical Office of the Republic of Slovenia. Retrieved 6 September 2012. ^ Kos, Franc, & Milko Kos. 1911. Gradivo za zgodovino Slovencev v srednjem veku, vol. 3. Ljubljana: Leonova družba, p. 259. ^ a b Snoj, Marko. 2009. Etimološki slovar slovenskih zemljepisnih imen. Ljubljana: Modrijan and Založba ZRC, pp. 72–73. ^ Information sign at the Bovec Military Cemetery. Wikimedia Commons has media related to Bovec. This page was last edited on 4 November 2018, at 15:42 (UTC).